Last year one of the most interesting music shows of Sweden Så Ska Det Låta has invited one of the loveliest bands in Sweden - Alcazar or to say more exact its female part to play this game when artists are guessing songs and sing them afterwards. Popular format and probably you also have analogues of this show in your country. We've missed whole show but these are videos I can't pass by and not to tell you about. Among other songs girls performed classic hits "Yes Sir I Can Boogie", "When All Is Said And Done", "Devil in disguise" and "Musik ska byggas utav glädje" making every bit of the show spectacular as they use to do with all their artistry, poses, winks and great vocals sure. 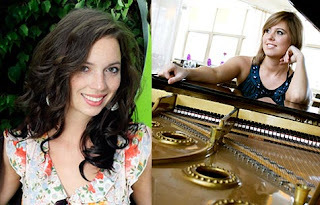 By the way this year firstly for a long time we'll get new pianists helping singers - Angelica Alm and Marika Willstedt (you can see their pics above) after Putte Nelsson and Stefan Gunnarsson. And hopefully we'll get names of this year participating artists in a closest weeks as well. Who would you like to see competing?